You want to adjust the email notification settings for an existing Image Backup (otherwise known as Disaster Recovery/DR) jobs and/or Retention jobs. These are the types of jobs which do not have any way, via a GUI interface, to enable or disable email notification for those types of jobs: All forms of backup other than jobs created in the “Backup” tab or “Copy” tab, including jobs created in these areas: Image Backup (DR), and Backup Retention. This guide applies to these type of jobs that still do not have working email notification even if you have already adjusted the Default Settings -> Notification area of NovaBACKUP accordingly. NOTE: This should only be done after speaking to NovaStor Technical Support and is generally not supported! 1. You will need to setup Notification in the Default Settings area of NovaBACKUP first prior to doing anything at this point since step 2 is based on that instruction. Load NovaBACKUP and go to the large circle NovaStor logo button at the top left of the software to then find the "Default Settings" button to click on. When Default Settings shows up click the "Notification" tab. This is where you will select your Email Notification options. First, choose the level of notification such as "Always" if you always want to have an email sent to you after job completion, or "ONLY if operation had errors/warnings" if that suites you better and you don't want to have an email if the job completed 100% successfully for example. Then click on "E-mail Settings" on the right side of this same "Notification" tab screen. This is where you will enter your actual email address to send the email notification reports to. After entering the email addresses to send to you will click "Test Email Settings" button and once the test shows successful status then you can click on "Save". Then click OK at the bottom of the "Notification" tab screen. 3. Once the folder is open you will locate the file named "nsdef.ini" in this folder. Open this file in Notepad by right-clicking on the "nsdef.ini" file and click "Open" or "Edit". 4. Once the "nsdef.ini" file is opened in Notepad you will search for [email] with the brackets in-tact. You will then select all of the lines of text in the entire [email] section of the file. With your mouse go ahead and select all of the text contained in the [email] section which is about 16 lines of text ending with the line of text starting with "EmailSendTo". Once all of that text is selected you can do a right-click in notepad and then "Copy". Leave this file open in Notepad. 5. Create a new text file in Notepad and PASTE what you have copied in Step # 4. There is no need to save this file in notepad. 6. Back on your original Notepad session which has the "nsdef.ini" file opened in it you will scroll back up to the top of the file via the vertical scroll bar and search for [logs] with the brackets in-tact. You will then select all of the lines of text in the entire [logs] section of the file. 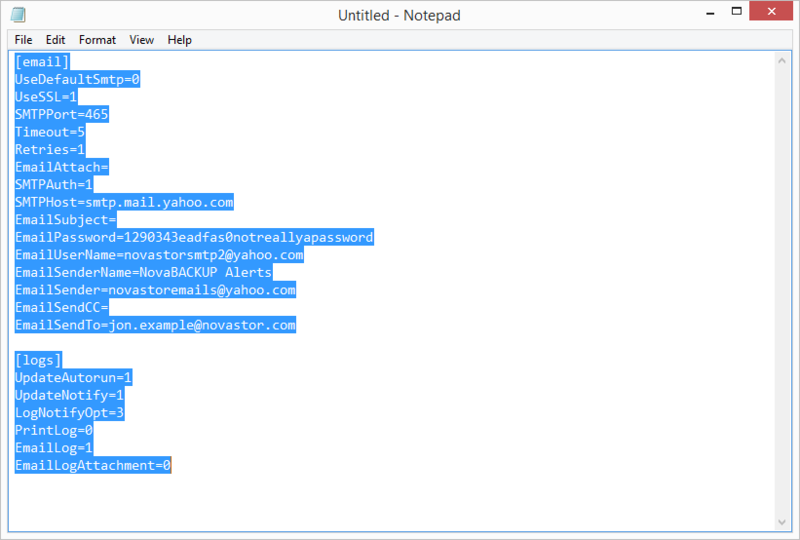 With your mouse go ahead and select all of the text contained in the [logs] section which is 7 lines of text ending with the line of text starting with "EmailLogAttachment". Once all of that text is selected you can do a right-click in notepad and then "Copy". Leave this file open in Notepad. 7. Back on your new text file that you created in Step # 5 you can create a new empty/blank line under the [email] section that already exists in that file and then PASTE what you have copied in Step # 6 in to this file. This is where all of your backup jobs exist that you can implement email notification in manually by following steps 1-8 of this document by pasting the appropriate lines of text over the top of whatever is existing in those two sections of your job script files (.NBK file extension). 10. Edit each .nbk (NovaBACKUP job file) and simply PASTE OVER TOP OF the already existing [email] and [logs] sections of text in each of your existing jobs, based on what you pasted in to Step # 5's new notepad file which contains the lines of text that you copied earlier from the nsdef.ini. When done save each of the job file(s) that you edit in notepad and exit out of notepad altogether. The next time your job runs it should email you according to the details that you placed in the .nbk file. If you use the menu and choose "Save As..." notepad will attempt to change the file extension to .txt by adding it, select "All Files" for type before saving the .nbk file. On SBS 2003/2008/2011: For full access rights to all system resources, add a new user using "Active Directory Users and Computers". Do NOT create this user using the SBS console! In the AD create this user in the directory "Users", NOT in dir "MyBusiness". This new user must be member of - local admins - domain admins - backup Operators. Move the primary group of this user to the "Domain Admins". Remove the membership of the group "Domain Users". Log out and log in as this new user. Log out and log in as admin again. Use this new user to configure your backup jobs and schedule ("log in as" and "run as").